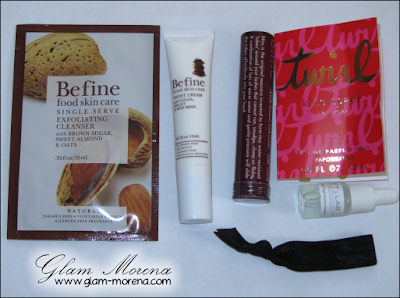 Glam Morena: My August BirchBox. 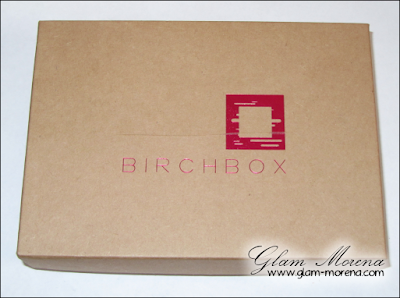 I received my second BirchBox earlier this month. I had already viewed the contents in my box before it arrived. I wasn't impressed and actually was rather disappointed. Once again the sample sizes were decent, but the actual products are pretty underwhelming. I ended up cancelling my BirchBox subscription. Befine Exfoliating Cleanser - Finding an exfoliator that’s effective without irritating your face is a bit like trying to find a needle in a haystack (and a scratchy haystack at that). This two-in-one product has gentle beads that first slough away dead skin cells and then melt into a creamy cleanser. It’s ideal for anyone who has sensitive skin or who simply wants to exfoliate every day. Befine Night Cream - It’s easy to blow off nighttime skincare routines, but your PM products are just as important – if not more – than your daytime ones. Our skin does the bulk of its repair work overnight, which means you should slather on the potent products before your head hits the pillow. We love this light cream, which uses cocoa and rice bran to heal and hydrate skin. Kate Spade New York Twirl - Kate Spade New York's charming designs are meant to be playful, feminine, and joyful — the same goes for the brand’s signature scent. Attention-getting without being overpowering, Twirl is an incredibly versatile fragrance. The fruity floral is as suitable for the office as it is for a cocktail party. And just like everything else in the kate spade new york universe, Twirl makes you feel instantly more pulled together and ladylike. Blinc Mascara - Talk about a beauty breakthrough! blinc’s high-tech tubing formula means we never end up with a smudgy mess halfway through the day or when we wash it off at night. It’s waterproof, sweatproof, and won’t irritate even the most sensitive of eyes so you can wear it all day without worrying about touchups. LIFTLAB Lift & Fix High Potency Solution - LIFTLAB designed this superhero product to do two main things. It reinforces the skin’s ability to protect against premature signs of aging and environmental aggressors. It also provides quick relief for the redness and irritation that can result from UV rays and cosmetic procedures. Both these qualities make it an exceptional all-around serum. The concentrated formula is ideal for anyone looking to protect skin and alleviate the signs of aging. Twistband Hair Ties - Back in the day, we used to rock scrunchies like they were our job. But now that we’re grown-ups (kind of), it’s time to graduate to something a bit more sophisticated. These chic hair ties keep hair secure without snagging strands or leaving ugly creases. Best of all, they look as good on our wrists as they do in our ponytail. I found the Twistband Hair Tie to be rather pointless. For one it's just literally a cut piece of elastic tied in a knot. These are being sold for $5.00 for a pack of three too?! I find that to be beyond ridiculous! 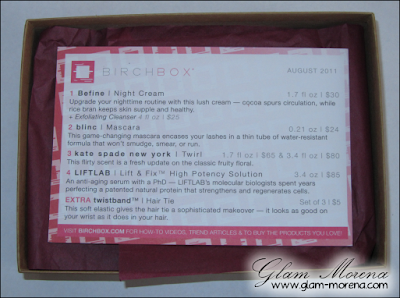 What did you get in your August BirchBox? I got the befine exfoliating cleanser in a previous birchbox but it came in a tube & I loved it!! I actually just bought the full size at Ulta. I got that mascara in this months & threw it out after 1 use because it did nothing for my lashes but weigh them down. Hey girl, we got the exact same box. *eyeroll* I cancelled mine after I received it, too. The ponytail holder is absolutely pointless. Like you said, just elastic tied in a know. Lame. 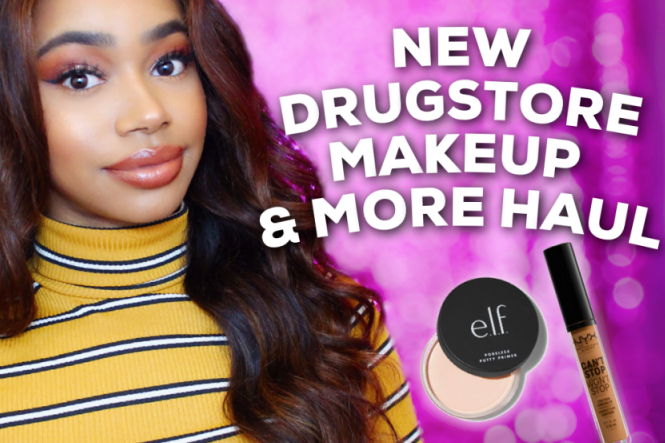 i agree, although i got some different products i am also disappointed... like really? alot of people have a lot to say about this months birchbox and not all good. i am going to cancel as well.